PIC: The big blue is very impressive and a must-see! 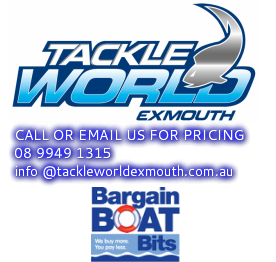 The biggest news in fishing in Exmouth this week is the 1089lb blue marlin that needs to be seen to be believed. Congratulations again to Captain Eddy Lawler of Peak Sportfishing and angler Clay Hilbert, along with deckhand Wes Jones and assistant crew Leigh Freestone and Hayley Dellar on the catch that made history on New Year’s Day 2018. An incredibly amazing cast created by Klarsic Creations of this Australian record fish is now on display permanently at Tackle World Exmouth. 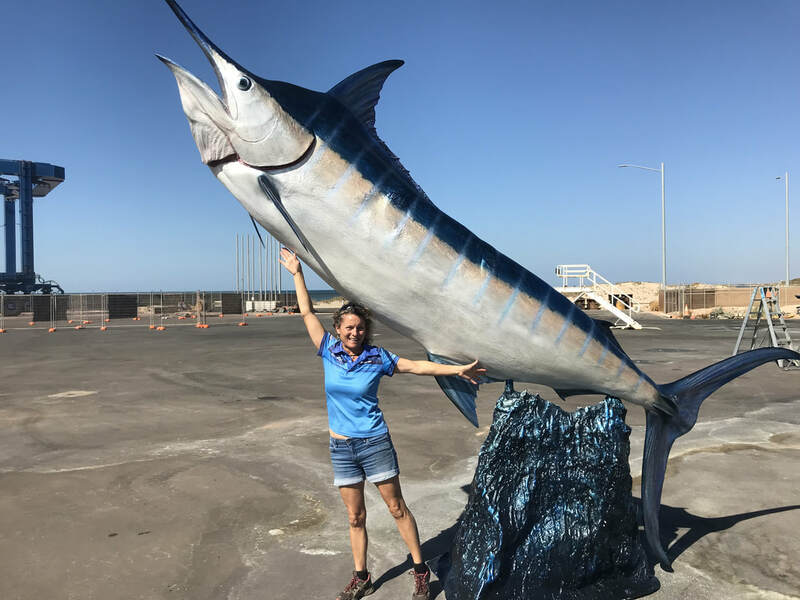 This fish will now live on forever and anyone wishing to grab a photo of themselves with such a big marlin, can do so daily. The sheer size of this fish is massive. We look forward to receiving the details of how old the fish is, which is believed to be around 15yrs. You have to see it.....its mind-blowing. Fishing is something you can do in Exmouth 365 days of the year, 24 hours a day. We are fortunate to have such a diverse range of options for getting out to relax, unwind and participate in an activity that around 1 in 3 Western Australian’s enjoy. I’m not sure of the statistics of people in WA that consume seafood, but I would guess that it would be even higher. Most of us simply enjoy it without voicing it. To be able to catch your own fish or seafood to eat, is something that we often overlook. We are very lucky here also to have such great seafood on offer from the local Fresh Fish Shack. Aiden and Campbell Fahl have been blitzing the squid lately while fishing from the boat. The rainbow coloured jig was a winner, while the dark squid jig also came up with good results. Squid fishing is a fun type of angling for kids and good way to help teach them how to clean up after a day on the boat. Cleaning them can make you itchy sometimes and it is recommended to use plastic gloves if it effects you. The main tip though with squidding, is to make sure you steep the flesh in paw paw or kiwi fruit to help make it succulent and soft to eat, rather than chewy. Also remember if you are frying the squid, to have a high heat and cook for minimal time. I’d have to say that the winter mackerel bite is here. Especially after the report from Captain Josh Bruynzeel of On Strike Charters that had 29 mackerel bites by 11am this weekend! The winter water temperatures have finally arrived and this change of weather is certainly noticeable in both areas of on and offshore. The Kaiken stick baits in 180ml have been the hot favourites for lure response. The areas have been both in the gulf and west side, so if you have a boat, it is well worthwhile getting in amongst the action. Mackerel are very tasty and drop in to store to ask us about how to butterfly the fillets. Every year we show people this method which is very easy, simple and presents well on the dinner plate. PIC: The Sullivan family from Tasmania and their awesome catch! The forecast for rain over the long weekend did not eventuate and the calm warm conditions were welcomed by many campers onshore and anglers on the water. The full moon and big tides made it interesting for shore-based anglers and several reports of large swell at the top of the cape prompts us to remind you to take care when fishing these areas. The swell in winter can be large and dangerous, particularly on the rocks at the tip of the cape and steep beaches. The fishing in this area is rewarding, with anything from small cod to giant hearing, queenfish, giant trevally and even the odd shark mackerel can come in close here. The sharks can be annoying here too, so be aware. Giant herring on fly is great fun and they tend to jump well and take off fast, making it an exciting day out on the water. In clear conditions you can see the fish and sight casting is very rewarding. Richie Netes was in Exmouth recently and was specifically wanting to catch a giant herring. He was successful during a day out with Ben Knight, which happened to be Ben’s birthday too! Celebrations were all round and Richie will return another day to enjoy the fly fishing off Exmouth. This week we have had quite a few tourists from the east coast in the store asking to buy cockles. Cockles are a great eastern state bait to target the bread-and-butter species of bream, flathead and whiting. Targeting these species here, anglers are best to use prawns, as it is the local bait that almost all fish (and adults!) love to eat. We recommend having a squid jig handy when targeting fish from the shore as well, as they seem to show up, especially if you use some berley to attract the fish in to the area. If reef fishing is your cup of tea, then make sure you enter the upcoming Reef Classic at the EGFC. It’s only $30 for adults and $15 for kids, with members getting a further 20% off. You could win some great prizes and have some fun times with other anglers. Evakool eskies and fridges. Huge shipment has just arrived. Grab yours today! PIC: Sam Magee Doogan and his bonefish caught from the shore! 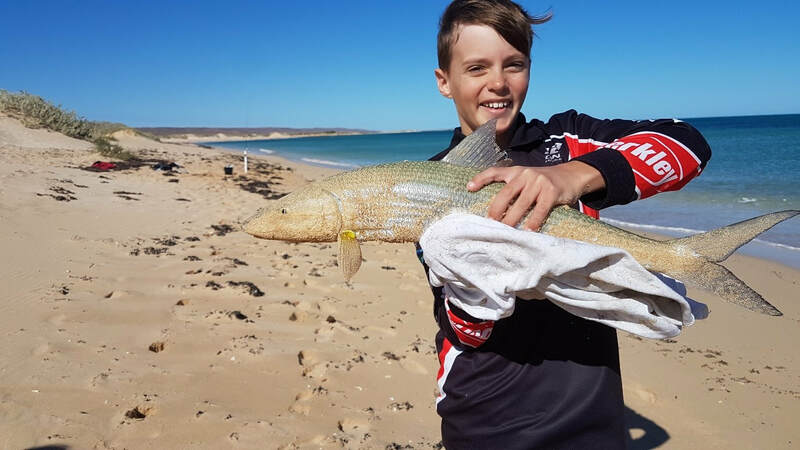 Young angler Sam Magee Doogan, aged 11 from Queensland was fishing at Mesa off the beach with his dad last week. They were using squid for bait on two lines that they had set up, with one small rod and one big surf rod. Sam was slowly winding in the line to check the bait, then felt a big strike. Sam had his drag set too tight previously and busted off on a fish, so he had the drag set light. The line started peeling away fast, so he tightened the drag slightly. The fish took a very long hard run and Sam kept winding flat out but had to let his arms rest for a bit because it was hard work! Sam finally got the fish in, but had no idea what it was! His dad thought it was a salmon, but a man said it was a bone fish, which is a highly prized sportfish. Sam was so happy because he had never caught a fish this big and this powerful. The fish was kept for a few pics and released healthily back to the system. Sam has entered in to our monthly fishing comp and hope he wins to get himself a cool shirt from the shop! Rob Widdup and his lovely wife Lucy come up from Australind every year and thoroughly enjoy the fishing Exmouth has to offer. This week Rob caught a monster Spanish mackerel that weighed 33kgs! The beast was caught out behind the islands in the gulf on Saturday with a floater on a Daiwa Catalina 6500. The reel was almost spooled on the first run, but Rob managed to get the fish successfully to the boat before any sharks set in. It was a two-man job though to get the fish inside the boat! As you can imagine, it fed plenty that night, with many more meals planned ahead. The continued rainfall, mixed with sunny days, is starting to green up the countryside and we are sure it is great news for the mangrove lined creeks in the gulf that are such an important part of the ecosystem for the whole gulf and surrounding waters. We love the rain to feed these creeks and look forward to some ripper seasons ahead, especially with prawns, crabs and fish that rely on the microorganisms and bait that live and breed in these areas. Many anglers and visitors coming in to the shop were feeling quite restricted with the fishing options and rain in recent weeks. However, we have reminded people that there is almost always somewhere to go fishing and get out of bad weather in Exmouth. Some anglers headed to the marina and others to the creeks. Tristen Wilson of Geraldton headed down to the creeks in the gulf and used a slow retrieve lure which resulted in some great javelin fish. Other anglers got some honker mangrove jacks up to 50cm, plus the usual bream and cod. 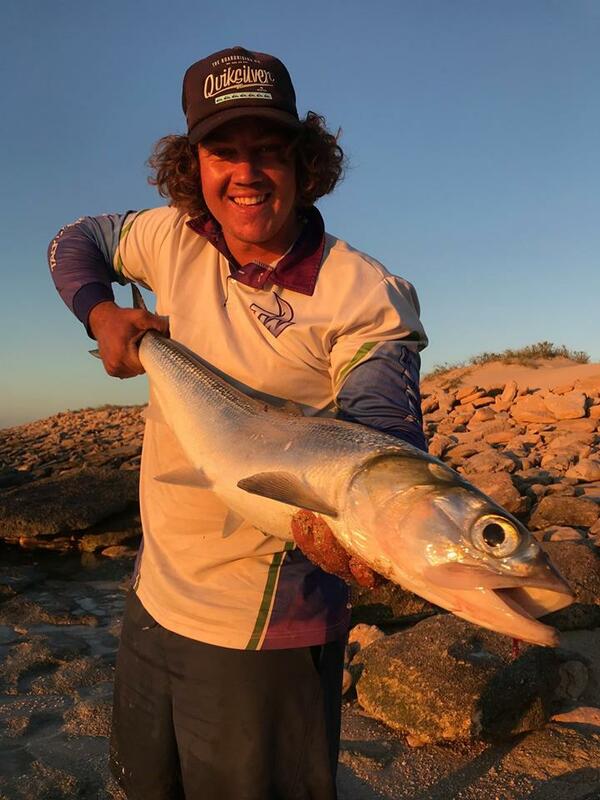 Danielle Pratt-Jenkin, also from Gero, went to the marina and was blown away catch a massive flathead and big mangrove jack using poddy mullet from the shop using 15kg braid. Danielle also got in to the queenfish in this area, which is close to the Exmouth Game Fishing Club. Pelagic shirts for teenagers and adults. PIC: An Exmouth mackerel caught by Brendan Martin is just one of the fish that is entered in to our monthly/yearly comp. Some days the weather has been sensational, others are a tad unfavourable. However, the fishing has still been very impressive this last week. Bluewater - Many solid fish coming from the 40-60m mark, including reds, trout and big spangled emperor all being swung over the gunwales in the past week. The best baits seen to be squid and flesh baits with many fish also being taken on jigs. Slow jigging and flutter jigs have definitely been the pick of late, but just remember the sharks are bad at times, so if you want your fish in the boat, wind fast and hard. The marlin fishing has also been productive with stacks of small blacks still around with the odd blue thrown in the mix. Switch baiting seems to be proving one of the best methods to snagging yourself one of these spritely acrobatic fish. If you’re not sure how to do this, call in to the store at anytime to ask. It is a lot easier than you think. Inside the Reef - For the punters that want to stay inside the reef, the fishing has also been notable, from casting lures for spangles to chasing blue bone on bait from your tinny. You always have lots of options. We have also been getting quite a few solid queenfish on small stickbaits and poppers and the odd GT. There has also been a few good sized golden trevally on the move both inshore and offshore. If you’re after a feed the spangled emperor are a lot of people’s favourite fish to target in this area. Look for a good weed bed and either drift over it or anchor up and start a small but consistent burley trail and you should be on. Don’t forget to keep your sinkers relatively light and be ready for a good run on light to medium tackle. 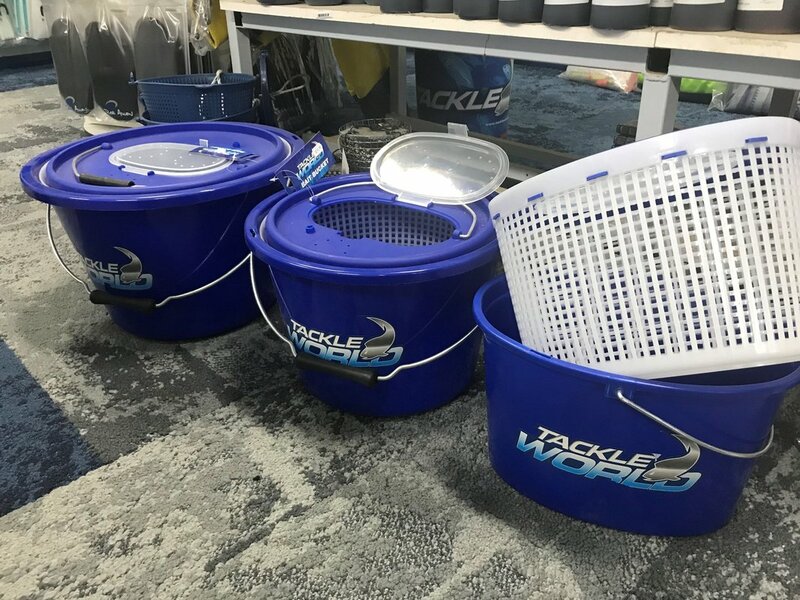 Bait Fishing - For the bait fishos the marina is a sure bet, with a good set rig and a nice steady burley trail you can expect anything from mangrove jack, bream, cod, javelin fish and everything in between. Even though it’s winter, the jacks are still being caught nearly every day. Another option is to throw some unweighted mulies around off the end of the north wall If you’re after some arm bending action. When doing this expect to catch some really nice sized queenfish, small to medium sized trevally and even the odd mackerel. If you’re staying over the west side, there has been some really interesting captures from solid blue bone, spangled emperor, golden trevally and even bonefish and permit all being caught this week. Your go-to baits for these guys are squid, prawns and even your WA mulies. Fly fishing - Let’s just say the conditions have been tough, with the wind less than ideal and the water quality not the best, you have to choose your windows wisely. In saying this, we have seen some amazing fish this week including some big bonefish in good numbers, golden trevally, blue basteds and even stacks of permit. The gulf has also been hard to fish with water quality low and the new moon bringing big tides along with the wind. Again, there is some awesome rod bending action to be had from the north wall at the marina with big queenies harassing all the hardie heads pushed in by the wind, just don’t forget the stripping basket. ​View Boards from Australia's Home Grown Brands! PIC: A giant herring caught from the shore about to be released. The rains have come and gone in a flash and it’s been great to have some water to freshen up the countryside. 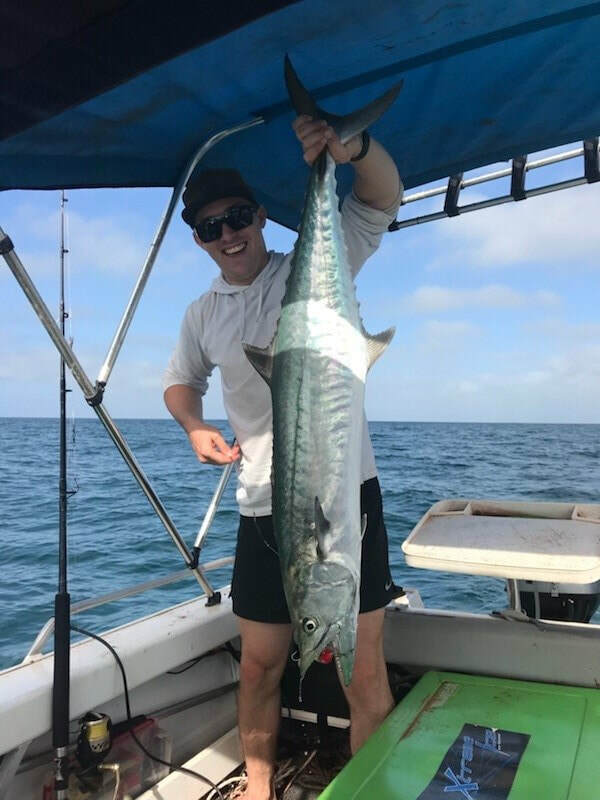 The fishing really turned it on in the lead up to the storm early last week with some great reports of explosive shore-based action and some awesome fish still being taken from the blue water. Outside the reef the fishing has been fantastic. The water cleaned up quick after the recent downpour and the afternoon winds have been dropping right out, making for some pleasurable sunset fishing. The marlin are still pretty thick with many reports of multiple captures and even a couple of sails turning up in the spread this week. The bottom bouncers are still finding plenty of fish also with some great mixed bags coming from around 50-80mtrs. The same old problem with the sharks exists, so wind them in fast so your catch doesn’t end up as shark food. Trolling lures has also been a good method to scoring a nice mackerel or two with plenty around but nothing too big being reported. The inshore reefs and land-based fishing this week has been crazy. Some of the local guns have really put on a show this week with giant herring, big queenfish and some trevally all being landed from the shore. All of these fish were taken on lures, with stickbaits being the standout for sure. The spangled emperor are always a fun target and can still be found in good numbers inside the reef. The squid are also a great target with good numbers being caught over the west side, especially on the weed beds surrounding Tantabiddi boat ramp. The squid jig of the week would have to be white with other popular choices being pink and some people also reporting black as being a winner. The gulf is still fishing well and has cleaned up quite quickly. The rain has definitely stirred up the crabs and the blue manners are moving around in good numbers. These guys are hungry and there is a stack of ways to target them, with your best method being a scoop net, a pair of shorts and a good quality set of wading boots if you don’t have a boat. The marina has come clear and still producing some entertaining fishing with the odd jack still being caught and good numbers of bream, cod, queenfish, and trevally all being consistently reported. The best baits are mullet, prawns and muellies, pairing this with a well set rig and a steady burley trail your already on your way to success. The fly fishing has still been tough with the prevailing winds, but as mentioned there has been some windows opening in the afternoon allowing fly anglers to get their fix. Big queenies have been the flavour of the week with multiple meter-plus fish being caught and released. Bundegi boat ramp and Mildura wreck being the stand out spots for the shore based fly anglers and if you’re in a boat, the west side has many more options and can be quite a nice spot to hide from the easterly winds. There has also been some quiet rumours of big mangrove jack coming from the broken flats on the west side. Happy fishing folks. ​Great variety. In store now.